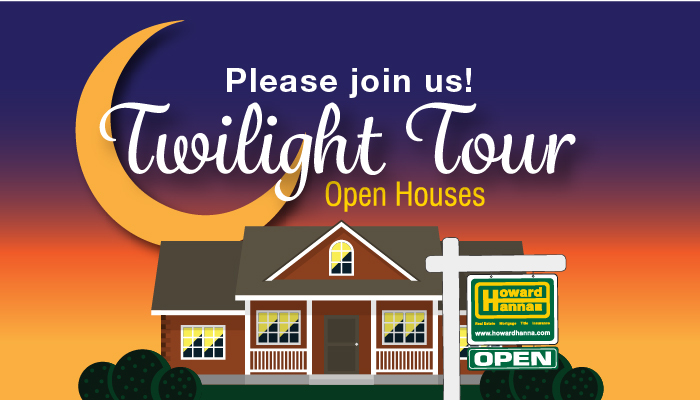 Cleveland, OH (May 23rd, 2017) – Starting this week and continuing throughout the summer, Howard Hanna is offering monthly Twilight Open Houses on midweek evenings from 5:00 p.m. until 7:00 p.m. This Wednesday, May 24, buyers can visit homes in Pennsylvania, Virginia, Michigan and North Carolina. Open houses in Ohio are on Thursday, May 25. In today’s competitive real estate market, open houses can be a helpful way to connect buyers and sellers. Howard Hanna’s unique Twilight Open Houses give buyers the opportunity to tour a property in a casual setting and sellers the opportunity to showcase their home at its very best. Every open house hosted throughout the five participating states will have a professional sales associate on-site. They will be available to discuss programs offered exclusively by Howard Hanna, including “My First Home,” “Buy Before You Sell,” “Apartment Dweller’s Trade-In,” and even our 100% Money-Back Guarantee.